I am starting a new feature here, where I'll post weekly about things--food related or not--I've enjoyed over the week. These might be foods or wines I've liked, cool products I've found, recipes I've bookmarked, books I've read, movies I've seen...whatever. Secured wireless internet access: I finally got my internet installed at home, instead of trying to use whatever wireless signal I could find. I gotta give my friend Larry Brown mad props for coming over last Sunday to help me set up the router. Now, if only I could figure out how to change my signal name from PornPornPorn (you're so funny, Larry!). Poach Pods: I saw these at Kitchen Conservatory, and I am very curious to find out how they work! Chimay Grand Cru cheese: I bought a wedge of this cheese, which has a rind soaked in Chimay Grand Cru ale, from Whole Foods. It is a creamy cheese with a pungent, almost bitter aroma and flavor. Interesting. 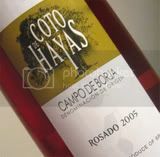 Cotos de Hayas Rosado 2006: A rose from Spain, this wine is quite yummy. Dry but fruity with refreshing strawberry notes. Orzo with Roasted Vegetables: Lisa of Show Me Vegan brought this dish to the St. Louis food bloggers potluck on Sunday. You can find the recipe here. Lavender Pear Cupcakes: I got to try one of Stef's famous Cupcake Project cupcakes at the potluck on Sunday. Here's her post. Meatloaf Cupcakes: Another dish from the potluck. This one is from Iron Stef. Foodie tees: I will probably order a few of these funny foodie tees to wear to work at Kitchen Conservatory. This one features a carrot with the caption "[bite me]". New shoes: I bought a brown pair and a black pair to wear to work. They have Dr. Scholl's gel inserts built into them. Now, I'll be gellin'! Your FF list is a fun idea. 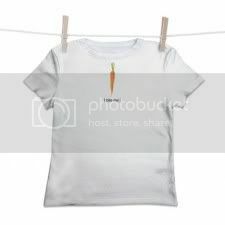 And that tee will be perfect for your new job. Glad to hear you're liking the new job! I'd love to talk teaching again sometime. Maybe we should hit a restaurant sometime... you can eat, I can review and we can chat. It's cool you'll be gellin and all, but you better still rock the Chuck's from time to time. Oh, don't you worry about it....I am even considering buying a new pair of Chuck's! I used to use a DIY version of the poachpod to cook eggs. It makes for much more consistent poaching, though I don't think it's technically poaching at that point - more like steaming or something. Still tasty, though.